Mara Kapsner-Smith started swinging bells in 2013, encouraged to try an intro-to-kettlebell series at her gym. Despite having stabilized her weight after years of yo-yo-ing and lifting weights in barbell classes, she felt like she wasn’t getting stronger, her posture was poor and she had myriad aches and pains. Mara met kettlebells and became, in her words, “obsessed.” She loved its whole-body aspect. And she felt like she was relearning good-quality movement she had lost from years of studying and working desk jobs. After moving to Seattle, she reached out to Andrea U-Shi Chang at Kettlebility and spent two years training and practicing to earn her certification. She joined Kettlebility as an instructor in 2015. Mara sees parallels between her work as a speech pathologist and her work as a Kettlebility instructor. She’s a clinician personalizing behavior modification. She’s trained to apply motor-learning principles to developing and generalizing movement skills. And she helps patients and students set measurable and attainable goals and creates plans for reaching them. Mara holds a bachelor’s degree in Spanish and Portuguese Studies from the University of Minnesota and a masters in medical speech-language pathology from the University of Washington. 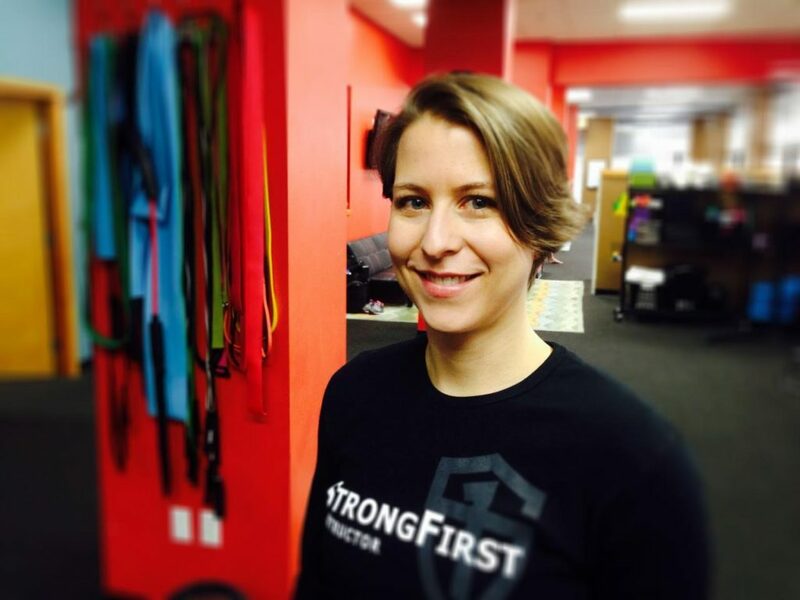 Her certifications include Strong First Level 1, Functional Movement Systems Level 2 and Ground Force Method Level 1. 1. Favorite health food you couldn’t live without? 2. Favorite non-health food you couldn’t live without? Dark chocolate. Although I like to think it’s healthy-ish. 5. Who are your heroes? Not sure I’m the hero-having type. I really admire strong women who live their lives according to their own ideas and passions, not to please others.